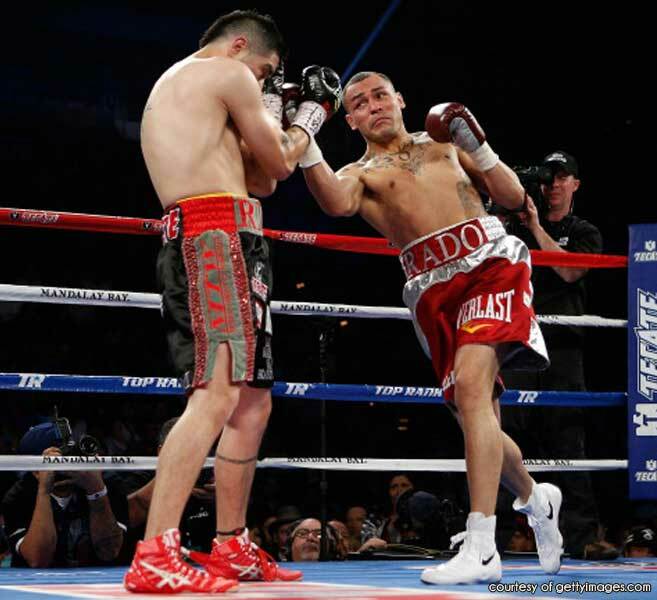 Mike Alvarado (34-1 23KO) probably expected the media to make him the underdog in his rematch with Brandon Rios (31-1-1 22KO), but the overwhelming amount of experts who picked Rios to repeat his success against Alvarado last October must have seemed ridiculous to him. 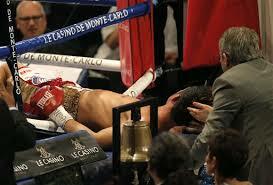 Or perhaps Alvarado simply didn’t care what the ‘experts’ had to say. In another all-action bout, Alvarado evened the score against Rios by using smarter tactics such as keep at an arms distance and using his jab to set up his offense instead of getting into exchanges. He won by unanimous decision with scores of 115-113 (twice) and 114-113. Rios kept the pressure on throughout the fight but when it became clear that Alvarado wasn’t going to divert from his game-plan Rios wasn’t able to make the necessary adjustments to take the Colorado fighter out of his plan. Alvarado didn’t perfectly execute his game- plan, which is what made this fight just as exciting as their first bout. Both fighters were able to rock and stun each other but they took the shots well and continued fighting. The momentum of the fight slowly leaned towards Alvarado as the bout entered the late rounds. Rios was able to win some rounds with his relentless pressure but Alvarado had the stamina to keep moving and punching to win the majority of the late rounds, and ultimately the fight. It was made clear that Rios wants a third fight with Alvarado to ultimately decide which man is better. However, the promoter for both of these fighters, Bob Arum, has made it clear that he doesn’t want to do an immediate rematch. That logic is understandable considering the history of immediate rematches between fighters comparable to these two. Think Corrales-Castillo, Vazquez-Marquez, or Gatti-Ward. None of these fighters were quite the same after their wars with each other. Most likely, Rios will fight a ‘gimme’ fight to regain momentum and prepare himself for his third bout with Alvarado. “Mile High” Mike’s options are more diverse as he could take on an opponent not considered to be in his class in order to recover from the two wars he’s been in and then after that take on better competition or Rios again. If you’re wondering what a ‘gimme’ fight is, just watch the Gennady Golovkin (26-0 23KO) vs. Nobuhiro Ishida (24-9-2 9KO). The Kazakhstani fighter took his time setting up his limited opponent by pumping jabs to set up his big right hands and hooks as well as set up range to catch Ishida with one of his powerful punches. Golovkin would find his mark in the 3rd round. A series of left hands followed by a powerful right hand to the chin put Ishida beyond the ring and on top of the bottom rope semi-conscious. The referee immediately waved the fight off. Although Ishida was considered a stay busy fight for him the knockout itself is still impressive considering Ishida had never been knocked out before that. This is Ishida’s third loss in a row. Golovkin seemed content but not overly surprised with his performance and has expressed a desire to fight the likes of Chavez Jr. and Sergio Martinez. A lack of desire from the titleholders to face Golovkin has forced him to take these sorts of ‘stay busy’ fights and have caused some fans to question whether he is as good as perceived. These critics may have a point since the only real noteworthy opponent Golovkin has faced has been Proska. But, the technique and poise that he shows in the ring cannot be questioned. The only way to show whether Golovkin is as good as everyone says is for some of the top middleweights to fight him and stop giving various excuses not to.